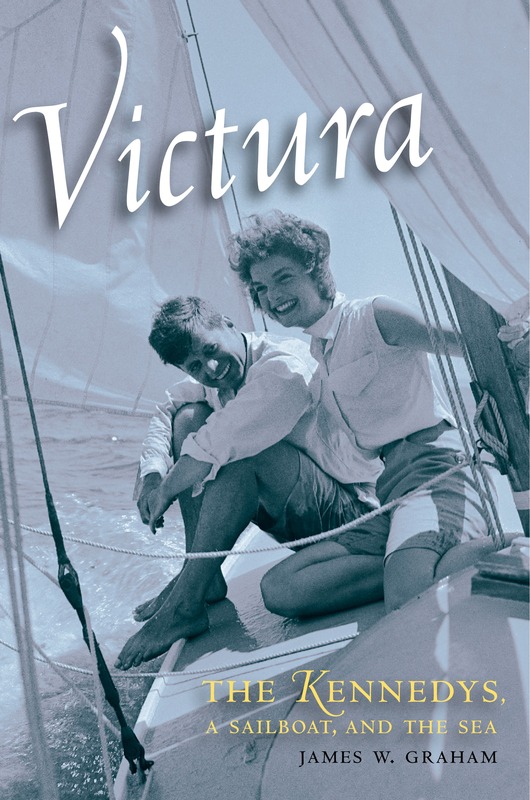 Author James W. Graham did a superb job when writing Victura, The Kennedys, A Sailboat, and the Sea. The exemplary insight it provides into Kennedy family dynamics in total is thorough, with massive quotes and footnotes in abundance. Its focus provides an understanding of several generations of the family. It was a challenge numerous quotes or excerpts. The author’s research was incredibly extensive. To those of us who lived through much of the spotlight time, the Kennedy name brings a reaction ranging from love to hate. Victura provides a greater understanding to all. Joseph and Rose Kennedy and their family journey started in Boston, but due to being Irish Catholic, social acceptance would never be achieved, no matter how astute of a businessman Joe was. He consequently moved his family to New York. They started vacationing on Cape Cod in 1925 and purchased a residence in 1927. My own sailing experience is limited, but I’ve been exposed to many who have expressed the teamwork that is required—tempers fly, language flares, and winning is the goal. A love of water, wind and elements radiate from those involved in this ultimate teamwork activity. Joseph Kennedy, Sr. did not sail, but immediately encouraged Joe Jr. and John to do so. Bobby and the rest of the children, as they came along, were encouraged, but Joe Jr., John and also Eunice excelled. During the school year, Joe Jr. and John would exchange correspondence with their father about what type of boat they should acquire and their research was rewarded. Victura, a 25-foot sloop, was purchased in 1932, and was the family favorite that was sailed the longest and raced the most. Winning at all costs was what mattered to Joe Sr.
Joe Jr. and Jack were among the top collegiate sailors in New England and Eunice was later considered equal. All the children were part of the sailing team, but they sailed to win. As the children grew up and married, they ended up buying adjacent or nearby property, and their Hyannis Port homes became known as the Kennedy compound. 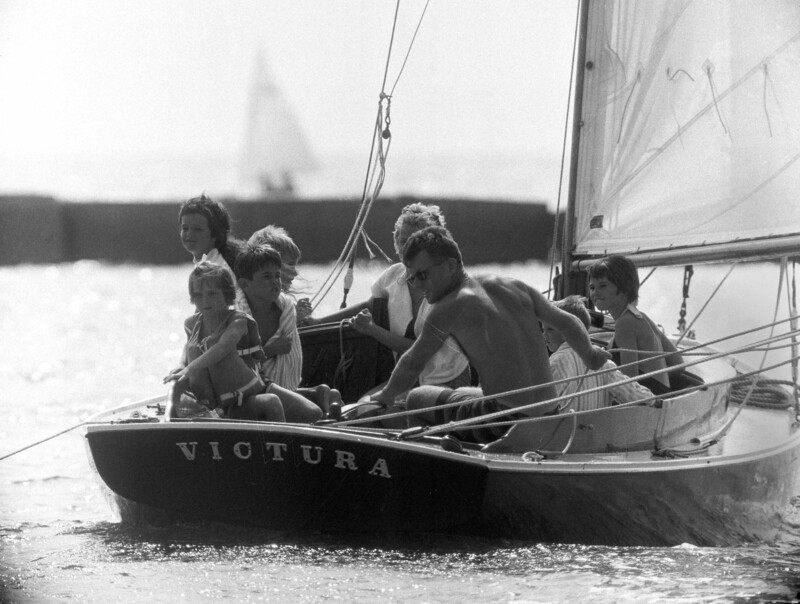 Most got their own sail boats, but the Victura kept active until Ted’s later years. Now, it is in the JFK library & Museum. Victura did not hide the facts Joe Sr. was not known for his morals or that teaching religion was left to Rose. This division of responsibilities showed the strengths and weakness of the entire family. Joe Sr. and Rose had instilled in them from birth the importance of public service, since they had all the financial resources they needed. It also showed how the Victura, sea, and bonding as a family mattered. Sailing was glue that helped hold them all together. Victura was indeed a family love affair. To read the Luxe Beat Magazine version of this article click on the title The Kennedys Love Affair with Victura. Maralyn Dennis Hill is Executive Editor of Luxe Beat Magazine and is known as The Epicurean Explorer. She was born to travel and loves to tell the tale. As a professional travel and food, writer, Maralyn is intrigued by all aspects of spa and culinary tourism. From local cuisine to Michelin Star, simple to gourmet, she thrives on discovering flavors, spices, and trends worldwide. Not only does she love to share the tales of unique customs, Maralyn also believes that her passion for global travel is the greatest geography lesson. The best part is meeting people along the way and hearing their stories. From Bocuse d’Or to being a judge at the Turks & Caicos Conch Festival and the Oregon Chocolate Festival and more, Maralyn is truly a world traveler. She is a frequent guest on radio shows and editor and contributor to more than eight print and online publications. Maralyn continues to reach an audience of several million in the United States and abroad. Her adventures don’t stop there. She has co-authored three books and from 2002 to 2006, she hosted a cable television show on Time-Warner. Maralyn is the past president of The International Food Wine & Travel Writers Association (12-2008 to 12-2012) and continued her work as a board member and co-chair of its Conference and Media Trip Committee through 2014. She is a member of the Society of American Travel Writers and the Society of Professional Journalists. When she’s not jetting to her next destination, Maralyn enjoys coaching individuals on writing and marketing successful projects. And although she lives to travel, she enjoys quiet time exploring. Specialties: Culinary tourism, luxury and spas, but loves all travel. Food judging is enjoyable and Maralyn enjoys using her conference, incentive, and meeting planning skills.